The 1953 Pulitzer Prize and coveted Nobel Prize for Literature in 1954, Hemingway declared his best work is yet to come. Five years later, Ernest Hemingway sits in front of his typewriter in a Spanish hotel room with the looming deadline. Insightful and provoking, Pamplona explores the struggles the writer dealt with in declining health, overwhelmed by his troubled fourth marriage and tormented by the ghosts of his past. Will he conquer the depression that threatens to consume him? 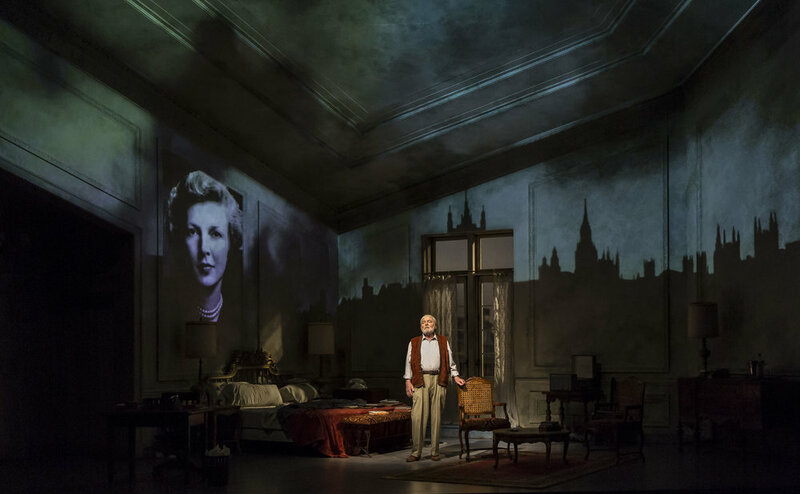 Stage and screen veteran Stacey Keach triumphantly returns to the Goodman Stage as Ernest Hemingway. Pamplona was originally set to run in the Spring 2017, but Keach suffered from a mild heart attack and was advised to take steps to recover on doctor’s orders. I admit that having attended the opening night last year had me nervous in regards to how the performance would play out and if I should abandon my original literary enthusiast expectations. I was immediately comforted the moment Keach gave his opening lines. The fierce liveliness in Keach’s demeanor and look in his eye was invigorating. My expectations were met and surpassed. Keach is no stranger to the portrayal the iconic Chicago writer, as he earned a Golden Globe Award and an Emmy Award nomination for his portrayal in the eponymous 1988 television mini-series. Directed by Jim McGrath this production delves deep into harsh realities that come with success. Self-doubt, depression and an artistic block all contribute to the struggle Hemingway experiences post-awarded the Pulitzer and Nobel. The performance illustrates the turbulent and conflicting lifestyle Hemingway was subject to with a rowdy crowd of friends in his early career and the love interests he’s had through his life. Keach delves deeper into bohemian writer’s psyche, who was often viewed as a hard-living macho man. The audience is navigated through Hemingway’s past through a breaking 4th wall juxtaposed to sequences in the present with a Hemingway and writer’s block. The structure between the two time spaces gives perspective to those dog-eat-dog mentalities and hard-edged lifestyle that Hemingway is so known for. There is a melancholy note though in the undertone in the writing, which makes this work so endearing. A study into the why he was the way he was. This is furthered in the beautifully airy set design by Kevin Depinet, which works masterfully with Adam Flemming’s projections. A white wash room with immensely tall ceilings highlighted by the French doors to the balcony and billowing sheer curtains contrasted against the ornately detailed wooden furniture. Very old world bohemian that makes your heart ache for a dreamlike summer day in Europe. This setting gives the blocking a relaxed movement through the space and as I mentioned before so much room to play with. Those dual time dimensions are perfectly honed by the space being used as a historical visual tableau upon the walls within the confines of the room. Audiences are treated to landscape imagery bleeding across angles and lines, while detailed wall moldings are utilized as perfect frames for portraits. One in particular that struck me was the moment the portrait was split between two moldings on the wall with one eye in each square – a photograph of Zelda Fitzgerald, wife of F. Scott Fitzgerald (author of the Great Gatsby). Hemingway disliked Zelda and blamed her for Scott’s declining literary output. This moment in the production through where Keach conveys Hemingway’s disdain in first person, this striking image alludes to the split personality disorder schizophrenia that Zelda was diagnosed with in the 1930’s. It was a very subtle moment and detail that really confirmed the research and illustrated care that comprised this performance. I adored the multi-media used and the clever way to make them come alive without being overdone or heavy-handed. Paired with a lovely soundscape and timely lighting cues, the art of visual story supported the character’s tales involving wild Parisian nights and plane crashes in Africa. Keach navigates the script beautifully in a dynamic way with a cadence that keeps audiences enraptured heightening the experience of this intimate expose. A wonderful evening of insightful and provoking imagery with an intimate view of a complex artist that begs further understanding and compassion to those often seen as one dimensional on surface. Pamplona runs now through August 19th in the Owen Theatre at the Goodman Theatre. For tickets, please visit GoodmanTheatre.org, or by telephone 312-443-3800, or in person at the Goodman Box Office (170 N. Dearborn). Stacey Keach in "Pamplona" at the Goodman Theatre. Photo by Liz Lauren.